Wrinkles Schminkles, girl you look gorgeous, what's your secret? What do we say to those fine lines we see in the mirror? Wrinkles schminkles! 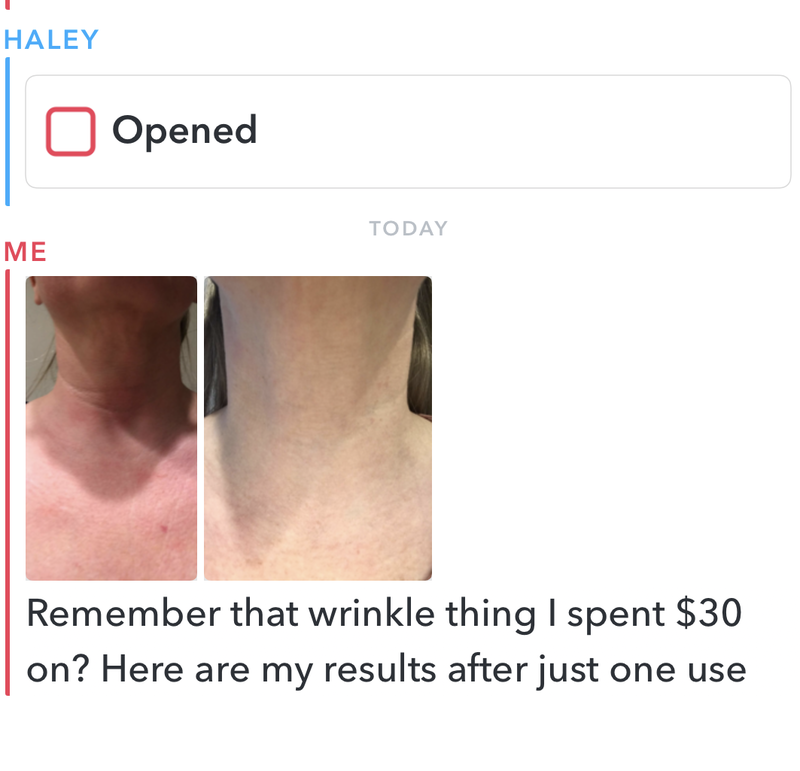 I'd be lying if I said I never worried about getting wrinkles. The first time I used a medical grade silicone pad by Wrinkles Schminkles I expected nothing. How many times have I got excited about a wrinkle cream or potion only to see minimal results when the bottle was empty? Still, I was going to an event and wanted to look my best, and that meant minimizing some of my deep wrinkles. I shared with Macey, our beauty consultant, that on a whim, I bought a product to use on my neck wrinkles. She suggested that I take a before picture so we could detect the slightest difference. Heeding her advice, I snapped a quick shot with my phone before putting on my wrinkles schminkles and hopping into bed. The next morning I removed the silicone pad and replaced it back in the packaging as the instructions show. I took a second photo of my neck, but I wasn’t sure if what I saw was just an illusion or if it were as noticeable as it seemed. So, like with all beauty related subjects, I sent the photos to Macey. She was blown away. So I sent the results to my mom, my friends, and my husband. Their reactions to my results confirmed what I was seeing. One of my friends even said it looked like an infomercial. We knew this was a product we wanted to share with our tribe, so we contacted the company. You can find a full line of Wrinkles Schminkles in the natural beauty section fo the TOM Shop. You guys know me, so I’m going to share those very first results. If you are new to this site, you may not know but I have Rosacea and my skin hates me. Quite often my face and neck will be very red by the end of the day then by the time I wake up it has calmed back down. So you'll have to overlook the color of my skin and just focus on my wrinkles, haha. I can't believe I just said that. Moving on! I was so excited about my results that I sent the photos to all the girls on Snapchat! No creases = no wrinkles. When you apply Wrinkles Schminkles, your skin cannot crease to cause wrinkles. The pads (approximately 2mm thick) are kept in place – comfortably and securely – using the convenience of adhesive silicone. It’s that simple. Doctors use silicone sheets to prevent and treat the appearance of existing scars. 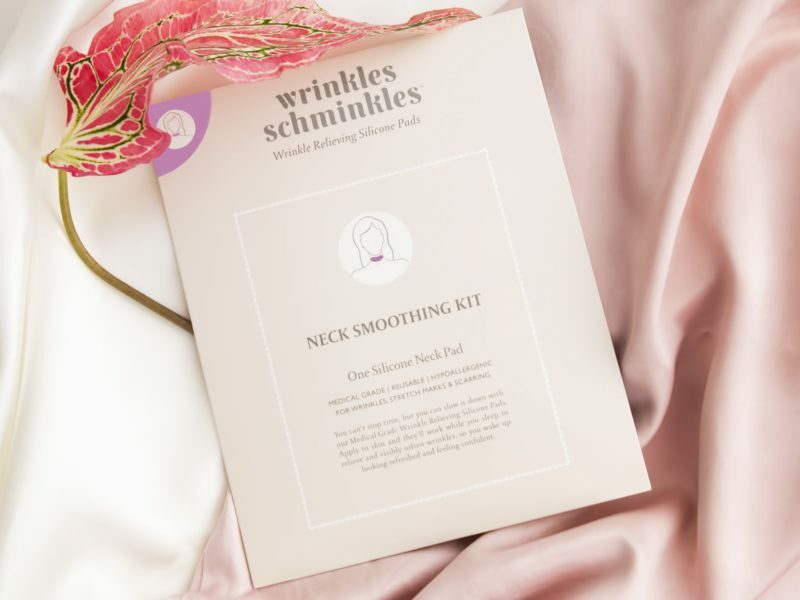 Wrinkles Schminkles Silicone Pads work the same way – treating the skin to hydrate and smooth wrinkles. Increased blood flow stimulates collagen. Using the patch one time will clearly reduce visible lines for a time, but it would be ridiculous for me to tell you that the results from one use are permanent. However, if you want long-term results or to prevent future lines from forming consistent use is key. Thankfully, Wrinkles Schminkles are reusable. With care one product can be used many times; using the cleaning solution will increase the life of your smoothing kits. Check product descriptions. Start out with the 3 step renewal bundle because you will want the cleaning solution to keep the silicone pad's adhesive sticky and afterglow serum to improve results. You can get a bundle deal for only $72. which allows you to save a bit over buying the products individually. Simply select which smoothing kit you want from the drop-down menu and add to your cart. Watch a demo of the forehead kit in this video. Results using the chest and decolletage smoothing kit, especially good for side sleepers, like myself. I started using the chest smoothing kit and it's so easy to use that I plan to continue. Consistent use will also help to prevent wrinkles developing on the chest area, which is one of the first places women show signs of aging. 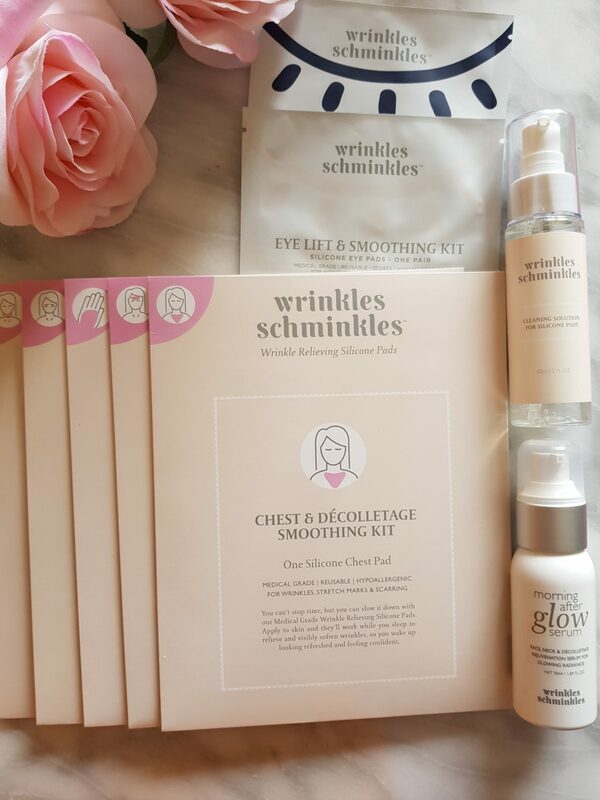 We just know that you will love the results from Wrinkles Schminkles! So what are you waiting for? 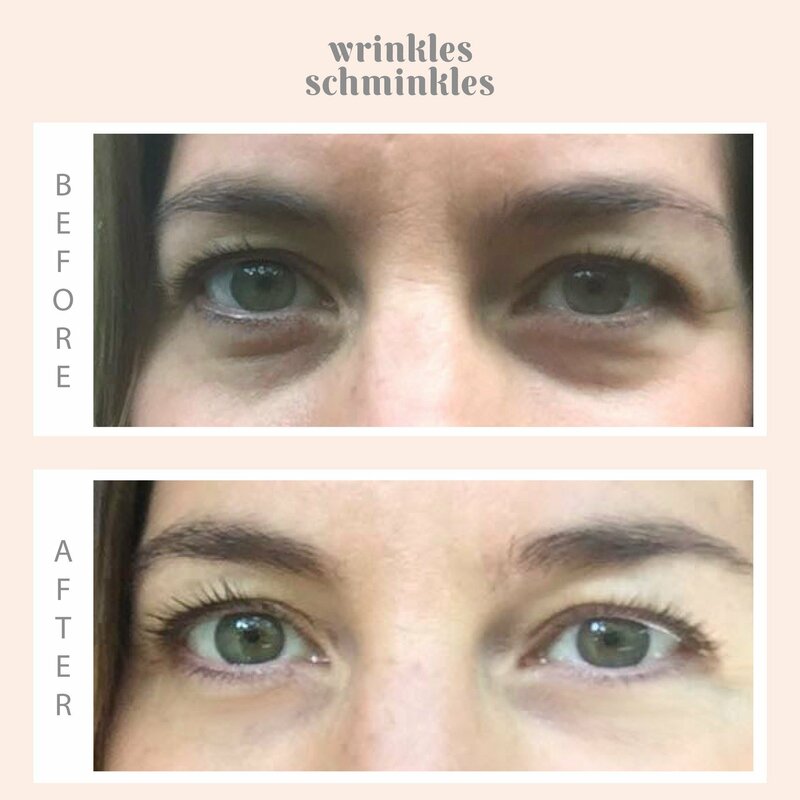 Say schminkles to your wrinkles! That’s where I started too Lorraine! I guess from always looking down at my computer, phone, books, dishes, cooking… it has made my neck wrinkle. Good choice!